So here’s an interesting one. My third great uncle was one Stephen Parker (me → George R. Weiss, my father → George A. Weiss, his father → Frances Ryan, his mother → Mary Parker, her mother → Stephen Parker, her brother). Like all the Parker kids he was born in Canada. His birth was likely in Ramsay Township near Perth about 1937. Father Patrick Parker and mother Mary Murphy took the kids to America sometime shortly before 1860. The family shows up in Glen Haven, Wisconsin in 1860, and in nearby Patch Grove in 1870. However, Stephen isn’t with the family in 1870. He enlisted with the Union Army on 16 May 1862. In that record, you’ll see that he enlisted with his brother Patrick. But Stephen was discharged not even 3 months later on 2 August because of injury. He shows up in the 1870 U.S. Census in Clarion, Iowa as a single man, farming. By 1880, he’s married to Margaret Burk, and they have two daughters, Mary and Agnes. But he’s no longer listed as the head of the family and the column for insane is marked! By 1895, he’s been committed to the Independence State Hospital for the Insane and is not longer living with the family. I haven’t been able to dig up anything that shows what his symptoms of insanity were. I thought perhaps alcoholism, but that doesn’t seem to fit with this news report filed shortly after his death, that appeared in the Waterloo (Iowa) Courier on 16 Jun 1897. An autopsy over the body of Stephen Parker at the Independence hospital has explained the cause of insanity in what physicians pronounced one of the most remarkable cases ever brought to the asylum here. 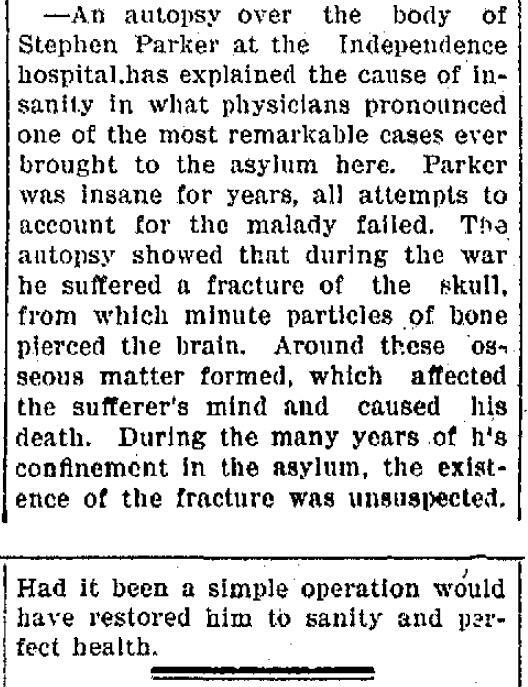 Parker was insane for years, all attempts to account for the malady failed. The autopsy showed that during the war he suffered a fracture of the skull, from which minute particles of bone pierced the brain. Around these osseous matter formed, which affected the sufferer’s mind and caused his death. During the many years of his confinement in the asylum, the existence of the fracture was unsuspected. Had it been a simple operation would have restored him to sanity and perfect health. So far this is the only madness I’ve found in my family tree, but there’s plenty more people to check out. The Stephen Parker family story doesn’t quite end there though. Margaret Parker and her two daughters moved to Seattle in 1906 where they became employed by the Seattle School District. I love it when they live in Seattle, because I have so many more tools to find them. The Seattle Times used to list who was teaching where every year. Margaret died in 1924. Mary taught elementary, mostly at Longfellow School, which I believe was across the street from what’s now Miller Playfield. She died in 1932, at 615 Bellevue Ave. According to King County, it’s the same building there now. Agnes taught high school mostly. She first taught at T.T. Minor. 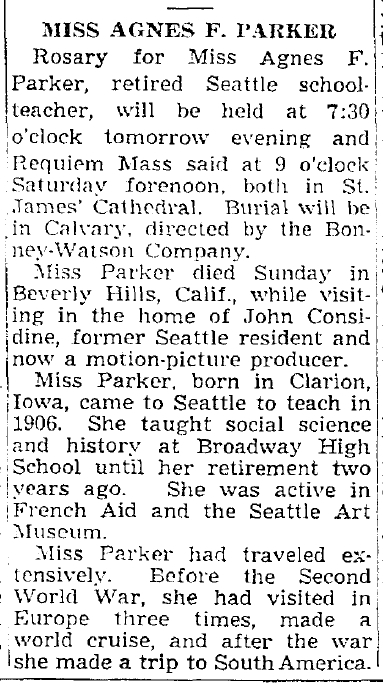 For several decades she taught at the Broadway School which used to be where the Broadway Performance Hall is now. But in the 1942 school year, she taught history at Ballard High School. Unfortunately, the paths between the Weiss side of my family and the Hathaway side did not cross; my grandfather graduate in the spring of 1942 and joined the merchant marine in May for the war. 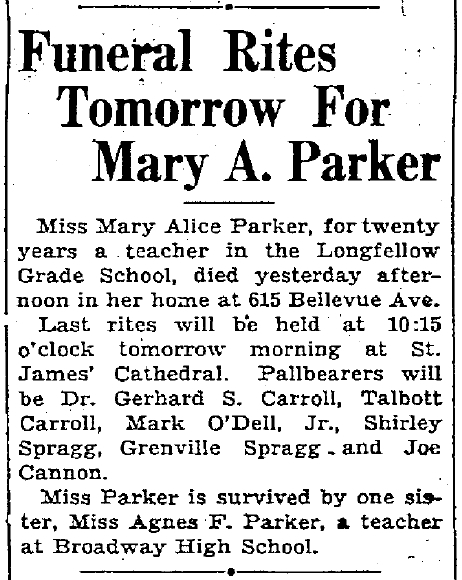 Agnes Parker retired in 1947. She was very involved as a supporter of the Seattle Art Museum throughout her time in Seattle. In addition to listing the teachers every year, the Time also listed who bought season passes for S.A.M. every year. And you think you give up privacy with Facebook! Agnes became friendly with the Considine family, local vaudeville and theater promoters until they moved to the burgeoning entertainment capital of the world, Los Angeles. It was on a visit to Hollywood producer John Considine Jr, that Agnes died. Neither Mary nor Agnes had any children, so that branch of my family is not running around locally. I had hoped at first though, when I first found them in Seattle. Huh. IMDB blocks links referred from LJ, but not those referred from my domain. There's something so charming about your family having been here for so long. I once heard a story that my great grandfather had spent some time in Seattle around the time of the Alaska gold rush before going back to New York to marry a cousin about half his age (which was pretty normal in that time and place) to start making babies. I'm guessing he must have been selling furs out here because I know he was a furrier while my grandma was growing up, and their last name was Kirshner which means furrier, but that's all I know and no one else still living has any more information. It's not much, but in the absence of any better knowledge of this person I'm descended from, I like to think of that as a sign of some sort of connection and family trait. I really think it's awesome that you're able to dig up all this great history about your family, and that you're interested in doing so. Thanks again for sharing these stories; I love learning about how people used to live. What was your great grandfather's name?